Cimarron has Comfortable Beds! - King bed & 2 Twin Beds, Leather Queen Sofa Sleeper with memory foam, New Bathrooms & New Kitchen, 3 flat screen TV's (Comcast & DVD on 50" HD in living room), Washer & Dryer, 2 indoor hot tubs & dry sauna. Use of the Upper Village heated indoor/outdoor pool & hot tubs within 2 minute walk. Breckenridge Free Ride buses & Free ski buses stop across the street and visit the Transit Station for more free buses to all of Summit County. "Breckenridge Business License No. 28901"
Owners: Jackson & Fiona - 40 yr plus in Breckenridge Jackson Streit owns & operates the Mountain Angler Outdoor Clothing, Gear & Fly Fishing guide business at 311 S. Main St. Fiona van Reisen is a Broker Associate at Re/Max on 220 S. Main St. Their son is a CU graduate and works as an engineer in Denver. 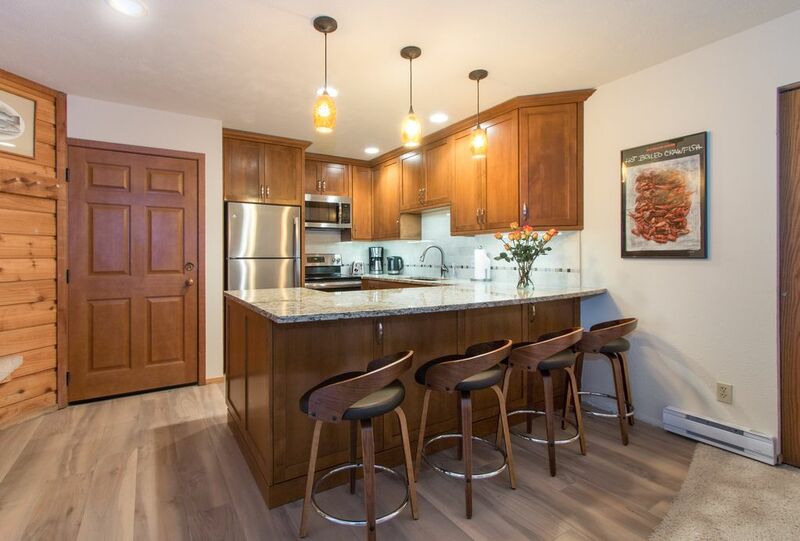 We chose this rental property for its central Breckenridge location, across from the Blue River and from our store. It's perfect for our fishing & skiing guests as well as a great Real Estate investment. Terrific location - one block from the ski lifts and one block from Breckenridge's downtown, historic district and entertainment. This condo has a spacious living area, washer/dryer, two large hot tubs, sauna, shared pool, elevator and heated underground garage. Both Bathrooms have just been totally remodeled. All New everything! One block from Downtown Breckenridge ! You will have fresh linens on the beds before your arrival . In unit for convienence. As well as larger machines on first floor ! Includes indoor heated garage that accesses the elevator- also outside spaces -1 auto per booking. Free wood- in the garage! large living area with two sofas, 50 inch hd flat screen, dvd player two speaker stereo system. all new 2017 Electric stove top with oven and broiler. a variety of items are available at any time including coffee filters, sugar, tea, salt, pepper. Don't shop till you check it out ! Feel free to use it all. 1- 55 inch in living room - 1 in each bedroom. We have a number of board games. Balcony accessed by a sliding door to living area. kayaking is available on Lake Dillon or local rivers. Bike rentals are avaiable throughout town. Outside wood deck with chairs and a view of the mountains and a Large patio on south of building with gas grill and picnic tables..
Trout fishing is great in the area. Contact Mountain Angler 970-453-4665. Breckenridge - walk to the lifts! Copper, Keystone, Vail, Arapahoe Basin Beaver Creek - 20- 45 minutes drive. There are a number of tennis courts throughout town and indoor, at the rec center. Breckenridge boasts one of the finest courses in Colorado- a 27 hole signature Jack Nicklaus course. Easy access for wheel chairs. There is a dry sauna in the hot tub room. Newly remodeled hot tub room with 2 hot tubs. Cozy condo within easy walking distance to town and lifts. We would certainly choose this rental again for future visits! Enjoyed everything about the place. Jackson was very helpful with all the details we needed to thoroughly enjoy the condo. The location was right across the street from F lot where numerous buses stop to make it handy to get around town. Easy walking distance to downtown. We really enjoyed our stay. Thank you Jackson. This rental worked out perfectly for our family of 4! The condo was located within walking distance (5 minutes even with 2 young children) to the ski lift and ski school which made our ski days extremely convenient - especially with the ski lockers in the heated garage. We loved being only 1 block from Main Street and enjoyed walking into town each evening. The condo itself had a wood burning fireplace that we used every night and a well appointed kitchen, which was wonderful. My only comments are that the condo could use some additional lighting and the master bed was a bit uncomfortable for us .... however, neither item was a huge issue for us and when we return to Breck, we will definitely be staying here! Thanks for the glowing review ! We will work on the lighting! This is the first notice of any problem with the bed but will be reviewing that soon. We hope to see you back again! Our family stayed here for New Year's Eve week and really enjoyed the property, especially the location. It is close to main street and the bus stop, which gave us access to all ski lift areas without having to drive and park. We also enjoyed the hot tub and gear locker for our ski equipment. Look no further and book this condo! The condo is perfectly located in Breck within walking distance to restaurants, skiing, and other activities. The condo is well equipped with anything and everything we needed. The living room/dining room is very large compared to other condos we have stayed at. The kitchen and bathrooms were nicely remodeled and updated. The jacuzzis were never busy and the outdoor pool is a short walk from the condo. THIS IS A GREAT CONDO AND GREAT LOCATION! We stopped in to Jackson's store and he was very friendly. We wished it was a little warmer so we could have booked a fishing trip with him. He also gave us several suggestions for dinner which were fabulous. We tried Southridge Seafood and Salt Creek Steakhouse and would recommend them to anyone. We also did two of the Escape Rooms which was a fun family activity.